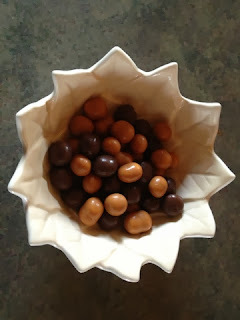 Ideal Protein Reese's Pieces are made by combining Chocolate Soy Puffs and Peanut Soy Puffs. How did that commercial go? Someone got chocolate in my peanut butter! Someone got peanut butter in my chocolate! Well, this is the Ideal Protein version. I love the soy puffs because they are crunchy and sweet, and don't have a protein aftertaste. But I LOVE this combination! Reese's had it right, chocolate and peanut butter is the perfect mix. And the best part is that I get to have it two days in a row, since I mix the two packages together, and keep half for the next day.